epiroc.com Epiroc introduced another first in hydraulic breaker technology. Many of the company’s heavy hydraulic breaker attachments now feature the patented Intelligent Protection System (IPS). All other heavy hydraulic breakers in the Epiroc range will incorporate it during 2018. Seamlessly co..
komatsuamerica.com Komatsu America Corp. introduced the new PC390LCi-11 hydraulic excavator, the first 3D semi-automatic excavator with the nimbleness and speed of the popular 36-ton weight class machines, and stability of much larger machines. It’s powered by an 8.8-liter, 257-horsepower, EPA Tie..
An updated PL61, part of the Caterpillar full line of purpose-built pipelayers, retains its familiar comfort and easy maintenance features, while enhancing performance and safety. Delivering 40,000 pounds of maximum load capacity, it has a 128-inch easy transport width. For superior maneuverabilit..
Volvo’s revamped D-Series offers new skid steer loaders (MC110D, MC115D and MC135D) and compact track loaders (MCT110D, MCT125D and MCT135D) with more strength, greater capacities, and improved safety and operator comfort. Equipped with the next-generation, curved single loader arm, the D-Series is..
CASE Construction Equipment’s newest C Series compact excavator, CX30C, is powerful and nimble. With an operating weight of 6,020 pounds and 4,520 pounds of digging force, it can still be towed with a pickup truck, without the need for a CDL (local and state regulations may apply), and is well-suite..
Ditch Witch has introduced a new 275-horsepower track trencher named the HT275. With its power and 70,000-plus pounds of mass, the HT275 is significantly smaller than most big track trenchers, can do jobs that smaller trenchers can’t, and is much more versatile than other trenchers of comparable si..
Seyedsaleh “Saleh” Behbahani, doctoral engineering student at Louisiana Tech University, received a scholarship from the Underground Construction Association (UCA) of the Society for Mining, Metallurgy and Exploration (SME). The $5,000-scholarship was established to promote the study of tunneling a..
GeoEngineers Principal Jon Robison, P.E., was chosen by the American Society of Civil Engineers (ASCE) to lead the Task Committee creating a Manual of Practice on the Direct Pipe trenchless method. Robison has more than 20 years of experience in geotechnical, trenchless, geohazard, construction and ..
HammerHead Trenchless of Lake Mills, Wisc., a Charles Machine Works company, promoted three of its top personnel, representing a combined total of 54 years of industry experience, to newly created management positions. Ryan Boldan is director of Support Services, responsible for Marketing & E-Comme..
Dan Heath, for American Augers and Trencor, was elected president of the Great Lakes Trenchless Association (GTLA). With a 10-plus-year career at American Augers and Trencor, he is currently product support manager. He has been an active GLTA member for five years, serving on the Board and as a Manu..
James Ingold was promoted to senior vice president of Finance and Treasurer, and CFO, responsible for optimizing financial activities across the organization. He has been at GTI since 2012, overseeing finance, accounting, and information technology. Quinton Ford was elected to corporate secretary a..
Luiz Marcelo Daniel was appointed vice president hub Latin America-Americas Region, based in Curitiba, Brazil, responsible for strengthening the company’s market position in Latin America, while reinforcing the brand’s global efforts. He brings more than 30 years of experience, including more than a..
LeRoy Larson joined Felling Trailers Inc., as OEM sales consultant, managing existing accounts, and assisting in developing and improving the technical and marketing aspects of the company’s Power Gen and OEM product lines. He has more than 20 years of related experience and knowledge, including wor..
Jeroen Hinnen is the new vice president of sales at ALLU, responsible for continuing the growth and international expansion of the Finland-based company. Hinnen brings a wealth of sales and business development experience, a strong focus on understanding customer needs, and a track record of success..
Ben Schmitt is the general manager at Westech Vac Systems, a part of Federal Signal. Schmitt provides organizational leadership and day-to-day management of Westech’s Nisku location, as well as business development, recruiting and overall growth. He has nearly 20 years of sales, engineering, and pro..
doosanequipment.com; actcontstructionequipment.com Doosan Infracore North America, LLC, expanded its dealer network, adding two branches of ACT Construction Equipment as authorized sales, service, parts and rental providers of Doosan equipment, including crawler excavators, wheel excavators, materi..
komatsuna.com Komatsu America Corp., a leading global heavy equipment manufacturer, will move its headquarters from Rolling Hills, Ill., to Chicago in 2020. Located at Triangle Plaza, the building is close to great restaurants, lodging and other retail options, and offers easy access to major high..
prim.com; willbros.com Primoris Services Corporation, one of the largest publicly traded specialty construction and infrastructure companies in the US., has entered into a definitive merger agreement to acquire Willbros Group Inc. In an all-cash transaction, Primoris will pay $0.60 per share for t..
allu.net With growth in its solutions portfolio, and its dealer/distributor network throughout Europe, Latin America, the U.S. and increasingly Southeast Asia, ALLU also focuses on strengthening the connection between them, products and distributors, and the link to customers. One way was a global..
volvo.com Volvo CE officially added Hawaii Truck Parts, Sales and Services to its dealer network. While a proven dealer of Volvo Trucks and Mack Trucks since 2010, and aligning with Volvo CE to offer spare parts and service for the last three years, the Hawaii dealership now adds the full range of ..
Juniper Capital Management and a team of co-investors created a new investment platform, Infrastructure Services Group (ISG), to conduct strategic acquisitions. The company sees tremendous opportunities in this sector, due to the enormous need for improvements to the country’s aging water infrastruc..
ntsafety.com National Trench Safety, LLC (NTS), opened a new branch operation in Seattle, Wash., under the leadership of Gene Nowlan. “Seattle has demonstrated strong, robust growth over the last few years and will allow us to strengthen and increase our support along the West Coast,” said Ron Chi..
pacwestmachinery.com; joshuagreencorp.com PacWest Machinery, the Pacific Northwest dealer for Volvo Construction Equipment and other leading brands., is constructing a new dealership facility in Spokane Valley, to serve eastern Washington and northern Idaho. Covering about nine acres, the new fac..
Lockwood, Andrews & Newnam Inc. (LAN) was selected by Alliance Regional Water Authority (Alliance Water), as a pipeline engineering consultant for a major water project serving several Texas communities in the I-35 corridor. Since 2007, Alliance Water, formerly the Hays Caldwell Public Utility Agen..
CASE Construction Equipment awarded the 2018 Dire States Equipment Grant to Surrey, N.D., for citywide drainage control and flood mitigation projects. Years of sudden urban planning and insufficient funding have caused flooding and infrastructure damage in the city. Several drainage-ways have fille.. The Plastics Pipe Institute Inc. (PPI) has created a new group within its Building and Construction Division, which represents plastic pipe manufacturers that produce various types of (pressure) piping systems used within buildings and on their premises. Those activities are now focused, through the.. 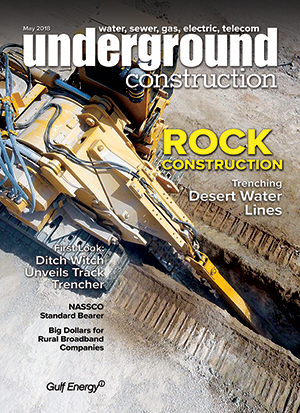 The University of Central Florida (UCF) Utility Department wanted a better excavation method. “We have a lot of old utility lines in the ground that haven’t been located in many decades,” said Anthony Lugo, utility supervisor. Traditional excavation methods – an excavator or hand shovel – for find.. The University of Houston’s Center for Innovative Grouting Materials and Technology (CIGMAT), and Department of Civil and Environmental Engineering hosted its 23rd-annual conference and exhibition. “Infrastructure, Energy, Geotechnical, Flooding and Sustainable Issues Related to Houston and Other Ma.. The rippling current of the 2008 U.S. housing market collapse struck more than just new home construction in cities like Phoenix, Ariz. It halted planned infrastructure improvements, and the combination proved fatal to many companies whose livelihood depended on the two sectors. A decade later, the..
Power & Communication Contractors Association (PCCA) President Jim Dillahunty recently welcomed more than 330 association members, family and friends to the 73rd annual convention in Kauai, Hawaii. Dillahunty, president and chief operating officer of Henkels & McCoy, in Blue Bell, Penn., told the o..
Broadband infrastructure was one of the big winners in the fiscal 2018 appropriations bill President Trump signed in late March. That bill included $600 million for rural broadband deployment through a new pilot program to be administered by the U.S. Department of Agriculture’s Rural Utilities Servi..
Mark Osadchuk, innovator, business owner, leader and inspiration within the pipeline industry, died April 12, in Scottsdale, Ariz., at age 83. His legacy began when he left his Alberta, Canada, home during the drilling boom of the 1950s, for the oilfields of Western Canada. There he worked for seve.. The American Rental Association (ARA) is collaborating with TechForce Foundation, as an associate partner in its FutureTech Success campaign, an industry-wide initiative to raise the profile of and provide resources for trade and technical careers. “The demand for skilled technicians to keep the eq..
At the April 4 meeting of the Gulf Coast Chapter of the Underground Construction Technology Association, Harrison Steed, P.E., senior project manager with Arcadis, discussed a complex project involving Dallas Water Utilities’ wastewater collection system. Spanning more than 230 miles of large-diam.. The National Association of Sewer Service Companies (NASSCO) has appointed Sheila Joy as its new executive director. In this role, she leads NASSCO in its ongoing mission to set standards for the assessment, maintenance and rehabilitation of underground infrastructure, and to assure the continued ac.. Under a new partnership with Gulf Energy Information’s (GEI) Energy Web Atlas (EWA), Stanford University’s Natural Gas Initiative (NGI) research will be supplemented with EWA, a comprehensive source of actionable project intelligence for the energy industry. The partnership also facilitates distribu.. The U.S. Environmental Protection Agency (EPA) is awarding more than $25 million in grants to help the country’s small drinking and wastewater systems, and private well owners, better protect public health and the environment. The grants will fund training and technical assistance to help workforce.. The U.S. Environmental Protection Agency (EPA) announced the availability of funding – up to $5.5 billion in loans – that could leverage more than $11 billion in water infrastructure projects through the Water Infrastructure Finance and Innovation Act (WIFIA) program. “Thanks to the President’s lea..
by Robert Carpenter Editor-in-Chief Early proposals for high-dollar infrastructure investment has created a unique buzz of excitement not heard since the much ballyhooed stimulus of 2009. Then, a President Obama-sponsored $800 billion stimulus package was passed. While there was much ado about aid..